TONI'S PURE NOTES, clear vocals and the way her voice touches each new note with ease before flitting on to the next works to great advantage on her new CD release, Who If It's Not You. R 'n' B, producing passionate and compelling songs that appeal to a wide-ranging audience  so much strength delivered with a surprising gentleness. Sultry star Tori's Who If It's Not You is an upbeat, soulful example of infectious and perfect pop. Fresh from her major debut performance at the Festival of Remembrance singing her Poppy Appeal song Please Remember in front of the Queen and an audience of 16,000  which earned her a standing ovation and a smile from Her Majesty  Tori is proving herself to be marked for fame. Singing for such esteemed company would be enough to put many new singers off their stroke; but not Tori. Please Remember was dedicated to those who lost their lives fighting for their country and Tori White shows a degree of maturity and professionalism rare in a teenager. Midlands-born Tori's honey-sweet voice has won her many plaudits already in her promising career, including the attention of legendary producer Jim Dooley who was moved to say: "We are about to unleash Britain's biggest new pop star in decades."  Tori's latest single, Who If It's Not You, is out on 14 January 2008 on Mbop Records and is available to download from the Mbop Megastore online at mbopmegastore.com/. Blog and music available from myspace.com/toriwhitemusic and toriwhitemusic.com. GLAMOROUS NEW SINGER TORI WHITE made her major debut performance in a unique and dramatic way  singing live to the nation on BBC Radio 2 at the Festival of Remembrance, at the Royal Albert Hall on November 10, in front of high-profile guests including The Queen. It will come as no surprise to her growing number of fans that she received a standing ovation. Unfortun-ately her appearance was not televised by the BBC because the Festival of Remembrance programme was not shown in full. A huge disappointment to both Tori and her supporters  and no doubt also to The British Legion. Tori's new single release, Please Remember is very special. Not only for the range of emotions her beautiful and powerful but controlled voice stirs  along with plenty of uplifting notes  but also because it was specially selected for the Festival and proceeds from the sale of every single are being donated to The Royal British Legion's Poppy Appeal. A worthy anthem for a worthy cause  and a great song!  Tori White's Please Remember was released on 5 November. The second track is I Ain't Going Nowhere With You (But Home). Catchy, commendable and a perfect foil. Tori White's biography and music are available at myspace. 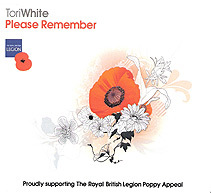 THE VERY FIRST LIVE PERFORMANCE BY TORI WHITE took place at The Goring Hotel, London in front of a media audience and guests on Tuesday, September 25 (2007) in conjunction with The Royal British Legion. 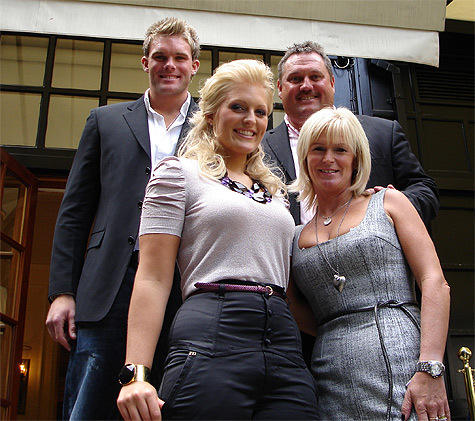 The Goring Hotel was chosen not just for being London's quintess-entially English hotel, but also because it is the place where Tori's father Nigel White had met Jim Dooley and asked him to listen to his daughter's recording. Tori is an absolute knockout and has that elusive gift of star quality. The depth and strength of her voice is quite astounding and she will go far. She should expect something big  we thought she had the pres-ence of a young Judy Garland when she was fresh and unspoilt. Each time you hear the CD it sounds fresh and new, but her singing is even better live. in any doubt why BBC producers were so moved by her singing and Remember Me that the song was selected for the 2007 Festival of Remembrance. Tori will make history by becoming the first pop artist ever to have an official song for the Royal British Legion Poppy Appeal*. Tori White benefits from the backing, love and support of her close-knit family: father Nigel, who clearly dotes upon his daughter; her mother Sue and brother Chris. You could quite believe her declaration You Don't Scare Me At All as she came across as being happy, confident and chilled out. But never, ever any trace of vanity. * The Royal British Legion provides financial, social and emotional support to millions who have served, and are currently serving, in the Armed Forces and their dependants. Please support the 2007 Poppy Appeal. For more information go to britishlegion.org.uk. WITH A LITTLE LUCK and a lot of talent, glamorous new pop discovery Tori White is hotly tipped for stardom. The girl with the exceptional, silky voice is making her debut major performance on November 10  live to the nation on the BBC at The Royal Albert Hall, in front of the Queen and other royal and very special guests. An artiste of revered musical standing, Tori is expected to follow in the steps of Victoria Hart as the latest 'Vocaltech' music academy graduate to be singled out for excellence. Victoria was the teenager for whom George Clooney recently helped to pull off a multi-million pound record deal. Tori's remarkable achievement started in January 2006 with an audition to enrol for the Vocal Diploma Course. Once course tutors had heard her sing, Tori was instantly elevated to the Master Diploma  the youngest of five vocalists chosen to take the Master Diploma by five years. Not surprisingly, she earned the highest grades for her six show-cases. Listening to her single You Don't Scare Me At All, her voice certainly has the feel of being 'established' and it was this unique vocal delivery that sparked the interest of the front man of one of the world's most successful bands, The Dooley's. Producer/legend Jim Dooley had a chance meeting with Tori's father at an hotel. "He mentioned his daughter was a singer and gave me her demo," says Jim. "I was blown away and agreed to be her executive producer. I played her music to a number of leading figures  including Dan Saxon and Mark James, the producers behind Simply Red. They knew she was an amazing talent and we started working on an incredible debut album  now we are about to unleash Britain's biggest new pop star in decades." BBC producers were so moved with one of Tori's tracks that it was selected for this year's Festival of Remembrance and it has subseq-uently been chosen as the official record for the Royal British Legion Poppy Appeal 2007. The publicity machine says: Tori's impending release has created a massive stir, and with such anticipation from industry and public alike, she bears a weight of expectation and is keen to live up to the hype. With a vibrant blend of soulful ballads, power-pop and R 'n' B hooks she is sure to do just that. Her heartfelt and meaningful songs appeal to a wide-spanning mainstream audience and fans of all ages. What greater platform could there be to officially launch this perpet-ually rising star than at The Royal Albert Hall? With a fresh and clear voice that oozes seduction as she delivers all that she promises, Tori White is a name to watch! music are available at myspace.com/toriwhitemusic.